Today I present for you the March UFO in finished form!!! This all started with a swap among blogging friends in 2010. Yes, 2010. Really, it even started before then, so let's go back a little further...let's say August 2008! 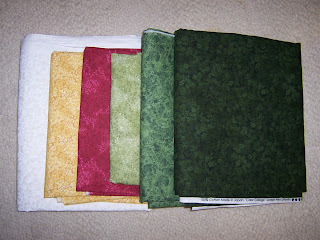 Way back then, American Patchwork and Quilting hosted a sort of mini-blog on their website. Somehow or other, I found these and started reading them. There was a group of ladies who blogged regularly and I started reading about their adventures. One of them, though I don't remember who, shared about a quilt-along at Patchwork Times - an amazingly beautiful star quilt - and Judy, the host, was doing a linky party so those making the quilt could share their progress. I think I want to do this! I'd never done much online sharing outside of e-mailing people I knew, so this was a little bit of a leap of faith for me, but I wanted to join! ...so you'll just have to trust me. I made this quilt and gave it to my friend, Penny, for her 40th birthday. This is the one I put a Pepto Bismol pink print on the back. She's a girly girl, but this was likely going on the bed she shares with her hubby, so I kept the colors tamer on the front. Anyways, the quilt got made and that was a big squirrel. 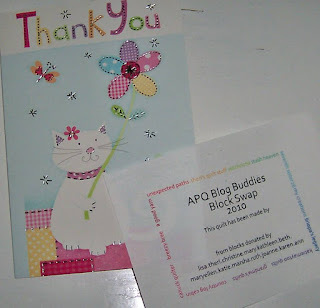 So we blogged there for a while, but near the end of 2009, APQ decided they were going to change the blogs. It was going to be more like a chat forum than a blog and many of us didn't like the changes, so we struck out on our own - to get "grown up" blogs of our own. Some went to Blogger, some went to Word Press, but many of us stayed in touch and kept blogging. We were each others first followers! And then somewhere along the the line, the idea of an APQ blogging buddies block swap came up. I jumped right in! We each had to make a bunch of blocks and send two to each participant. We split up the list so 2 people would be getting their blocks each month, but if you know me, you might guess I made all the blocks right away! For many months after this, I got to send boxes. I chose to include little goodies with my blocks and had fun watching the blogs to see what blocks my friends received from others as well as their reaction to what I sent. It was a fun time. Well, I think I did, but can I find THAT photo either? What the heck is going on? Another blog search turned up this photo from May of 2009, so maybe I didn't get it together as fast as I thought? I know I don't have any photos of the quilt after I put borders on and before I put it on the longarm a few weeks ago, so I'm not even gonna TRY to find those! 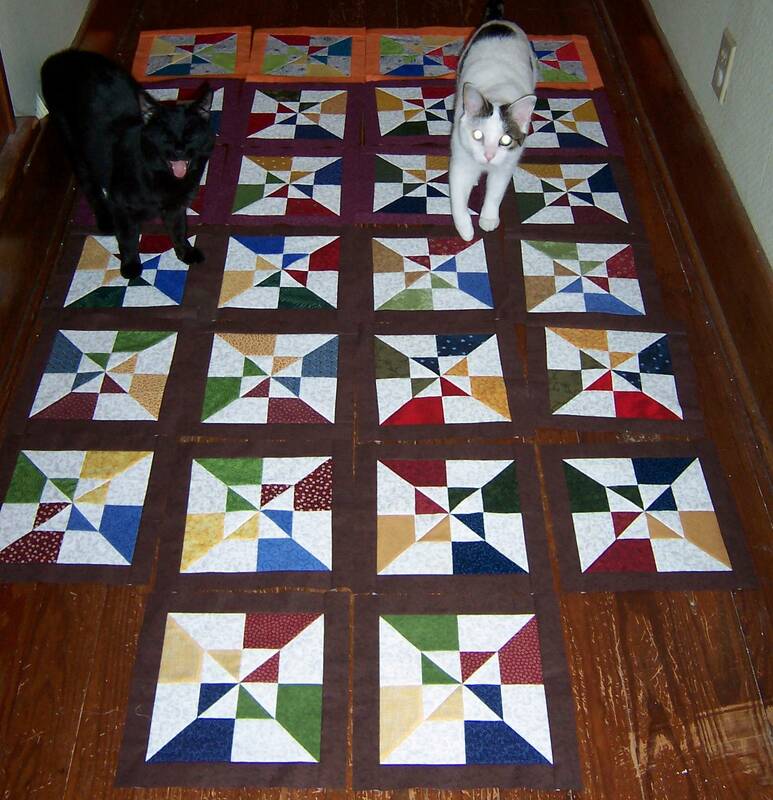 So when Judy, still of Patchwork Times, decided to do her UFO challenge again this year, I jumped in with finishing quilts because (since I let the cat out of the bag in December last year) you all now know I have TOO MANY tops. This one went on the list fairly quickly, though my numbering scheme doesn't exactly reflect that. I just kinda assigned them randomly, knowing Judy would choose numbers randomly anyways. Double random?! I procrastinated a lot on quilting this one last month. I just couldn't decide how I wanted to quilt it. I was terrified I'd ruin it. I felt I wanted something show quality done to it, but couldn't figure out how to work around all the names and such signed on the blocks. Finally I got over going around the signatures. The thread isn't going to distort it that much, right? (It didn't.) And then I dug through books and online ideas and stuff and finally came up with an idea. At about 9pm on a Saturday night. Too late to start, but at least an idea! But not too late to do a little doodling, right? I procrastinated more on Sunday so I got a late start on this, but at least I got it started. The first pass went splendidly. Even my pebbles felt okay. (I'm not very good at echoing or tracing patterns, but figured this was a good way to get better!) This just might turn out okay! The second pass...WHAT? My BORDER is WAVY? No. I know how to not do that. I'm better than that. I didn't do that. Really? I did that? (Insert naughty words.) Now what? I decided to take tucks as needed and get it back to square-ish as I went. The "top" and "right side" were better than the "left side" (quotes because this quilt is square and blocks and signatures go all directions, so it was relative to the loading, nothing more)... The "bottom" wasn't awful, but the top is the only side without any tucks. Even with all the pebbles, it STILL has problems. But here's a shot of it on the longarm. Before I discovered the problems. Oh yes, I shared my back fabrics in an earlier post, but I'll share those again, too, to make sure this post is even longer and includes every possible detail. (Are you bored yet?) This also gives me an extra opportunity to add a photo. Photos are good. I love the stamps and postmarks from all over the world (and I have a dot problem) and feel it fits because these blocks came from not only all over the US, but Australia and England as well. I had already made the binding (at least I did THAT right), so I sewed the machine side on and then procrastinated some more. I hand sewed a little, but put it down for a few weeks. Finally this week I forced myself to sit down, get Netflix going, and finish it. It took two nights, but it's DONE! You're not gonna get any closeups. Sorry. I took this just this afternoon and stood there in my yard trying to find a block that the quilting looked good and you could see it well, but couldn't find one that fit my criteria. So you get to use your imagination with the doodles I shared earlier. Now I know there's a label somewhere (thanks, Ann! ), but where did I put that? So technically, it's not complete, as it doesn't have any label yet, but it's going to get one. With probably more information than what is on the one Ann sent to all of us participants. So that's it. That's the whole story. Unless I forgot something, which I probably did. But I probably won't remember that I forgot it for long, so there's that. PS My April UFO is quilted and has the machine side of the binding attached already! A night or two of Netflix and it will be done. 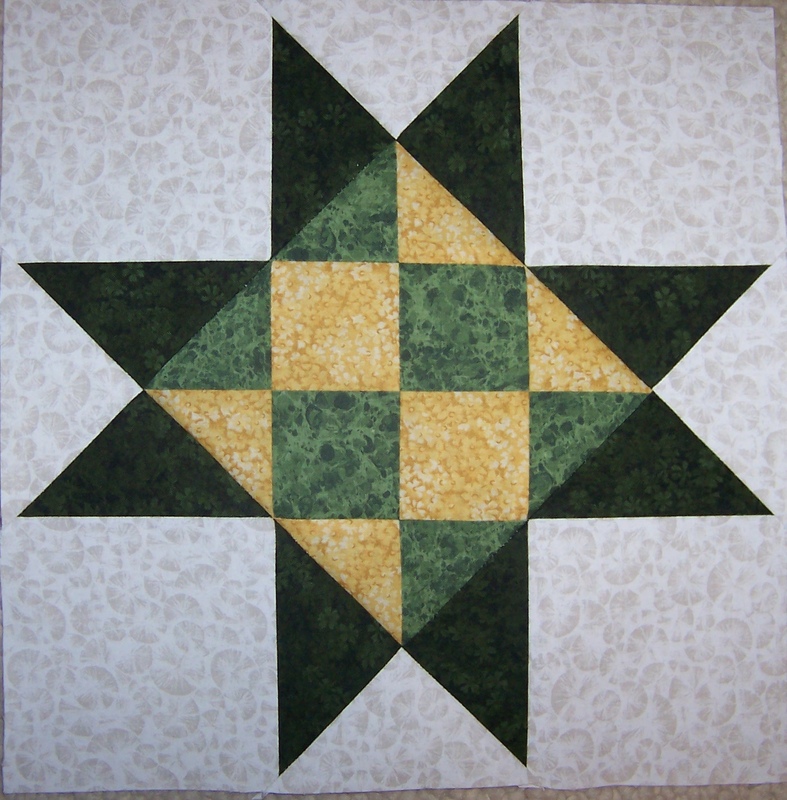 And my April dolly quilt is also done, but we'll save those for another post or two. Woo hoo! It's done! And I suspect you are being too critical of your quilting. What I can see from the picture of it loaded on your longarm looks pretty good. You just need to step away and come back to just enjoy it. I found my blocks in there :) I love having my swap quilt out to remind me of everyone. After all those years (just kidding) your friendship quilt really deserved to be done, and now it is. I think it looks amazing, and I bet anyone looking at it would say the same thing. Can't wait to see your other projects. 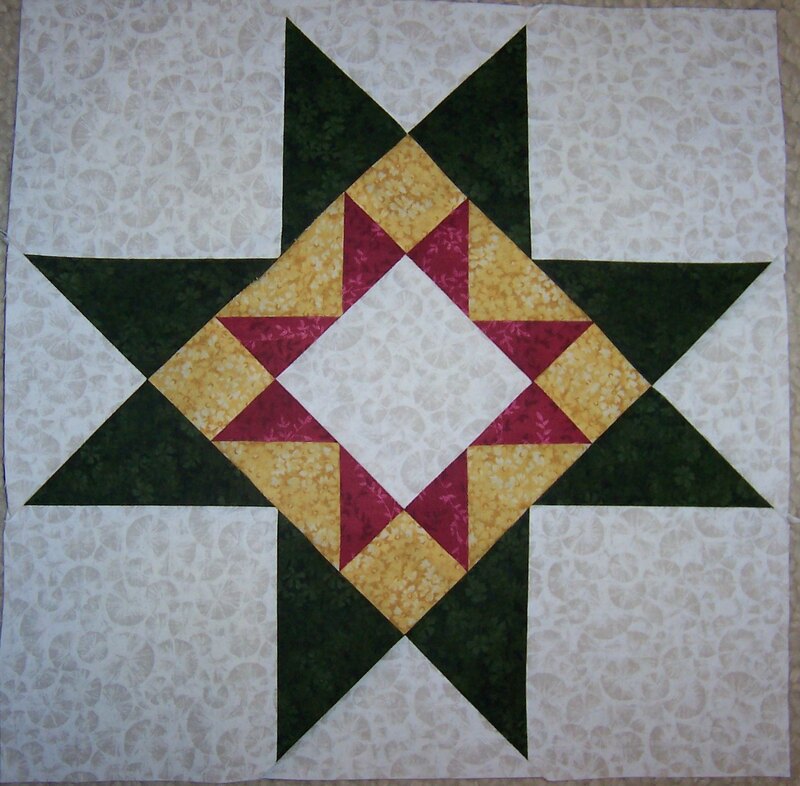 For sure, that is a very special quilt for you because of the APQ group. Glad you got it finished. It is beautiful! While reading your story of delays, I was whipping myself all over again because I didn't participate in the block exchange with everyone. 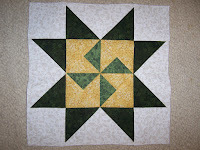 Instead you will remember I made my own APQ Bloggin' Buddies quilt, using the "spool" pattern. I wrote each APQ blogger's name and place of residence on a different block. I'm as proud of mine as you are of yours, but how I wish now I had participated in the exchange with everyone. I may have to give the link to mine in my next post. Fortunately, before our APQ blogs were deleted, I managed to get all of mine printed and in a notebook. I have continued to print all of mine, and I'm caught up to March 1, 2017. I wanted to use my blog as a record of all my quilts, even though at this point, my family and local friends do not know about it. My kids will find lots of big notebooks, properly labeled, with pictures and explanations, with every quilt I've made in date order. They probably won't even look at them, or maybe just trash them. I love to look back through them occasionally. (Good grief, this comment is almost as long as your blog post! Sorry!) ---"Love"
still nada done for me... 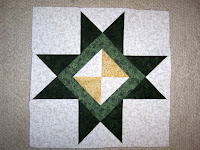 I did finish froggin' the April UFO, but have not started quilting either that one or the March one. Hubby went to sleep dr yesterday and ended up being taken to ER and then spending the night in the hospital. Another dr. appt. on Friday so it looks like it will be Saturday before I can even consider working on the UFOs. 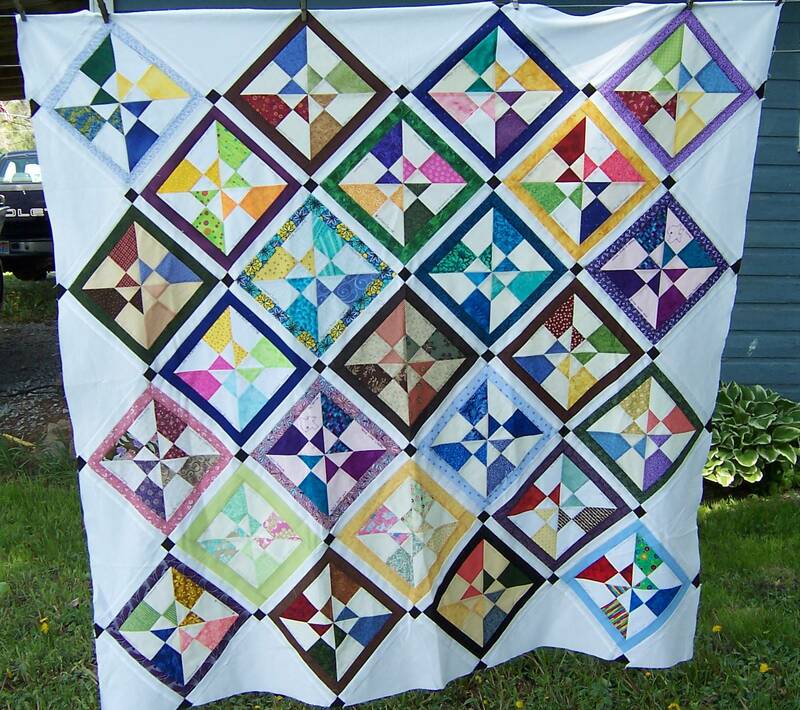 Love your quilt and the story behind it. 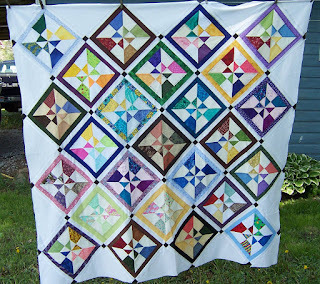 Contragulations on "finally" getting your APQ quilt finished!! It looks wonderful!! I'm glad you finished yours and now I'm wondering if everyone else has finished theirs. Mine is on the back of our couch right now and I still love it! I really love the block and maybe I'll use that pattern again some day. I'm sure you are very happy with yours. 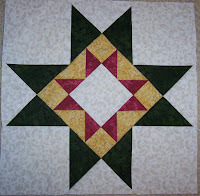 The quilting that I was able to see looks great. So good to see your finished swap quilt Katie and it was fun to be reminded of our blogging/quilting journey. I think you might be a bit harsh about your quilting (as we so often are about our own work). I think what made the swap for me was how those involved were so generous - we only had to swap blocks - but everyone sent goodies and handmade items. You made golf tee pincushions and I'm still using mine! My swap quilt (I took ages to finish mine as well) is on display and I smile each time I pass by it. Such special and happy memories stitched into those blocks. 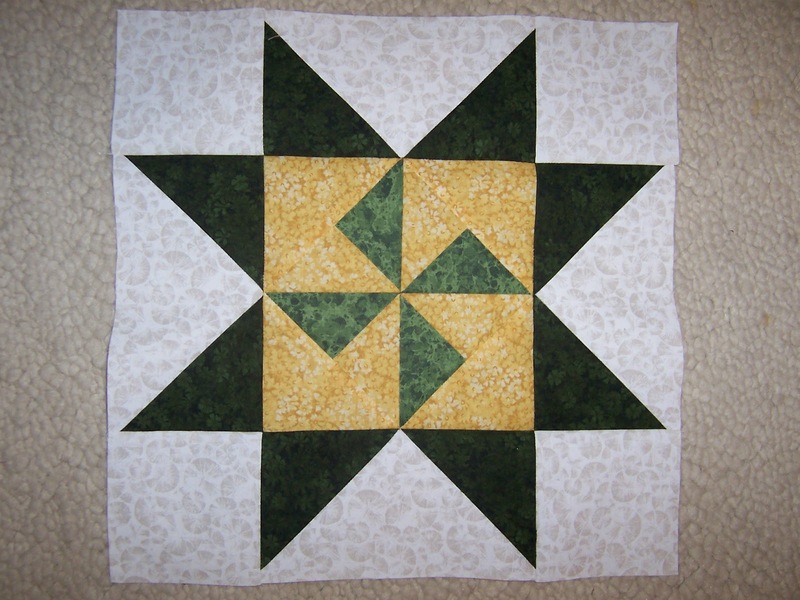 Congratulations on finishing your swap quilt! 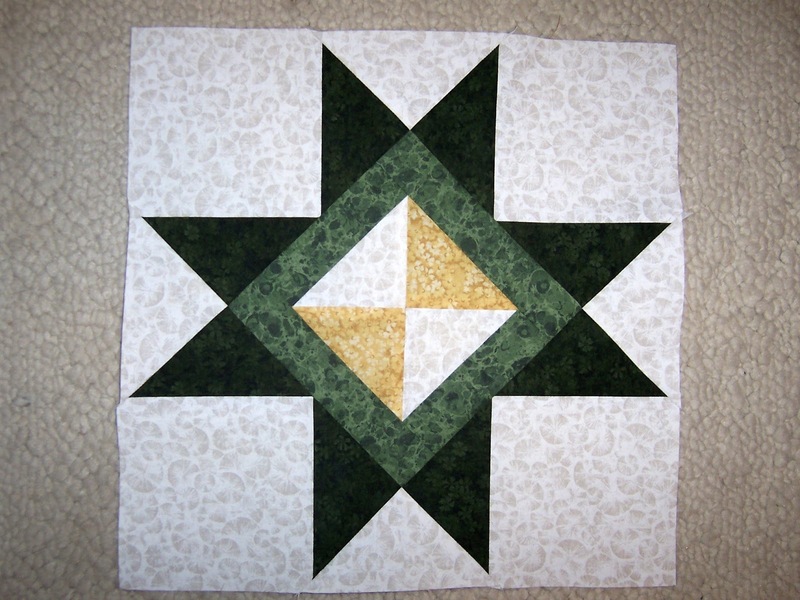 It is beautiful and the quilting looks great to me. I have mine hanging on a quilt rack in my living room and stop to look at the different blocks often. I have done other swaps over the years, but our group is my favorite because of everyone who participated. I still use my little pincushion, too. It is on the table right next to where I sit and stitch at night. Love that little "flower"! Enjoy your finish and all the friendships it represents!